When I attended an exhibition by John Buck at our local museum (NWMAC), noticed a strange shadow on the floor cast by one of his pieces via four lighting units on the ceiling. I transferred the image to a small canvas and traced the pattern of the shadow, cut a piece of deer hide from that drawing, and mounted it over the shadow. The shadow in the photo really looks like it's being cast by the deer hide. A reverse engineered shadow. 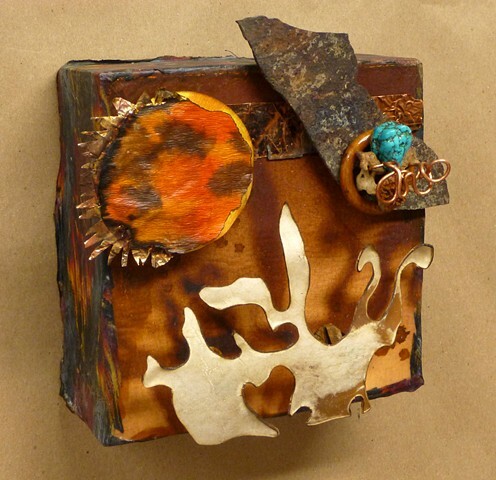 The rest filled with stone, imitation turquoise, dyed filter paper, copper sheeting and a tangle of copper wire. The sides are covered with the remains of one of my old neck ties.